15 oz travel canteen with twist open straw top. Lid screws on for secure closure. Lid top twists open and closed to reveal and hide the straw. 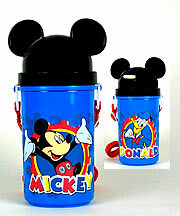 Canteen features Mickey Mouse on one side and Donald Duck on the other side.